Day off – and a PARTY in store! – Ce Soir Arts – Be inspired tonight! Day off – and a PARTY in store! We did hop a plane and have found ourselves “♫ ♬ south of the border…down Mexico way♬♫ …” What a glorious night we had here! A little dancing and romancing by the ocean in a beautiful place can really refresh the spirit – and sleeping within earshot of those restful ocean waves was just wonderful! We can faintly hear the ocean at home, but we’re at such an altitude we can just get a whiff of it. Here, it’s encompassing – and it’s warm here, so no need to close the windows. It’s very private too – we have miles of beach completely to ourselves. What luxury! Today has been sweet so far…a late breakfast on the deck and a nice walk along the beach got the day off to a great start. Next up…hours of reading by the pool and lunch on the beach which was sooo scrumptious and relaxing. Ahead we have another night of calm by the sea…another sunrise over the ocean…and another plane ride. This time: home. I love these little trips Aeon is always surprising me with. Such a love he is! We do have photos from Saintess‘ Rez Day Hippie Party, but…there’s a major happening at Ce Soir Arts tomorrow afternoon, and many of the same people will be about… It’s Owen Landar‘s Birthday tomorrow, and we’re having a COUNTRYFEST HOEDOWN up at the ROCKIN’ A&M RANCH! Yessir, we’ve got a ranch floating above the venue spaces – so come on over and enjoy it whilst it is here! We’ll keep it tucked away for other country shindigs, but it’s up and running for this very special event! Owen is a special friend to many people in SL. He’s a fantastic photographer and a very kind and genuine person. We love him at Ce Soir – and he and his funloving friends (like Christie Spad, to name just one!) are always welcome at Ce Soir! 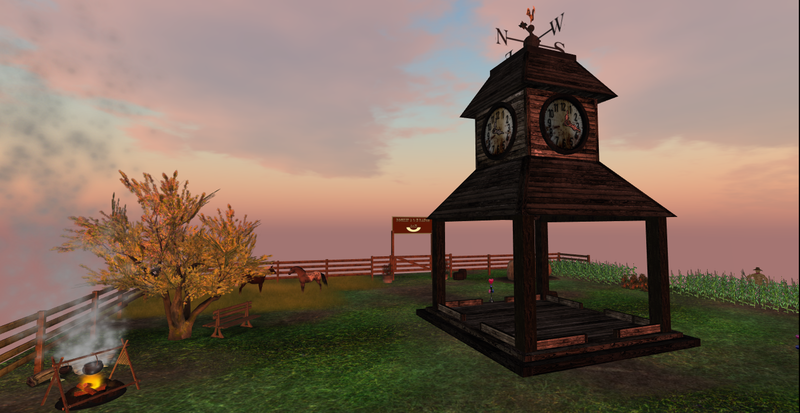 Saintess Larnia puts on her cowgirl hat to sing at 1 PM SLT for her buddy Owen. Johnny Paramour rides in at 2 PM to bring his special country flavour to the shindig! Come on over and party with us! YEEEEEEEEEEEEEE – HAWWW! Previous Avatar Blogger Month. Hm.